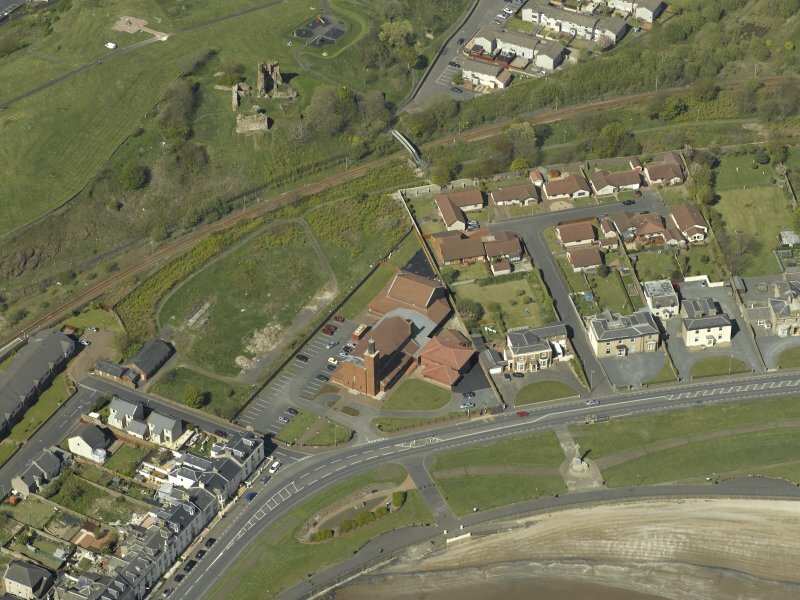 Oblique aerial view centred the Church with the remains of Ardrossan Castle adjacent, taken from the SSW. 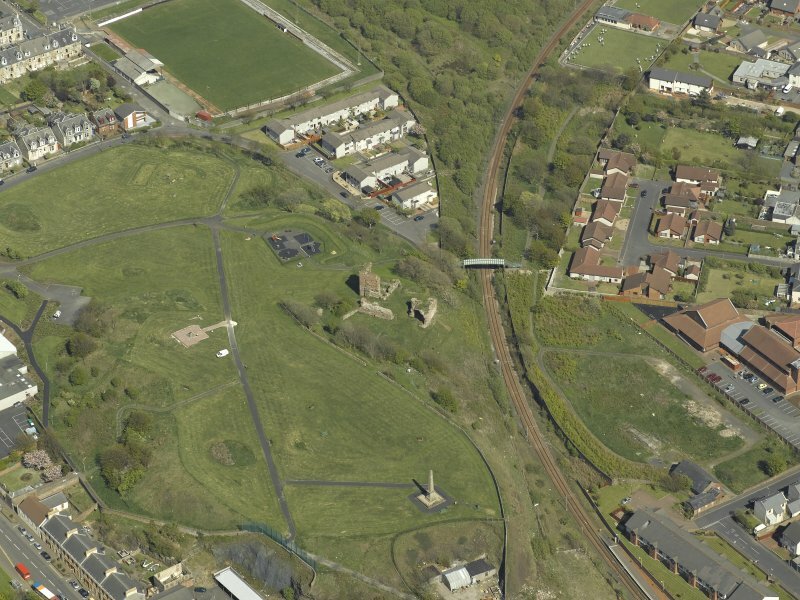 General oblique aerial view centred on the remains of Ardrossan Castle with the Monument and the Church adjacent, taken from the W.
General view of Ardrossan Castle. 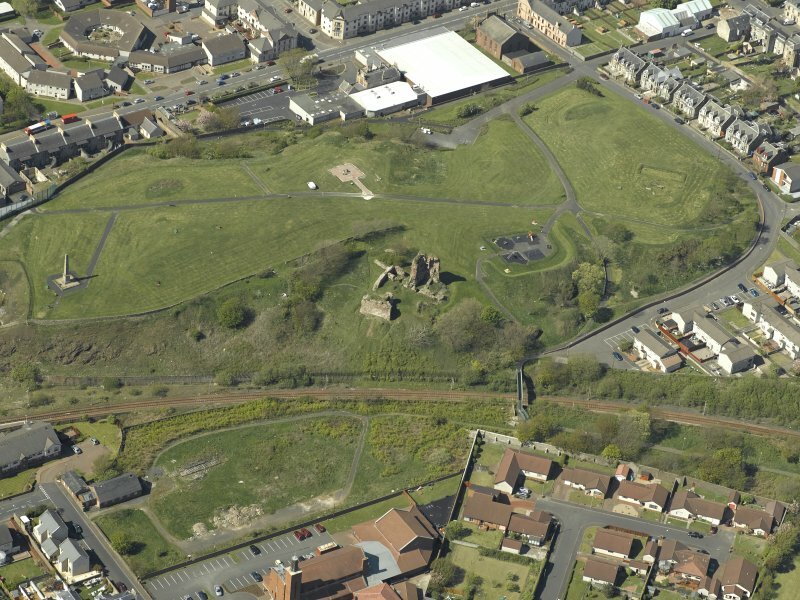 Oblique aerial view centre on the remains of Ardrossan Castle with the Monument adjacent, taken from the SE. 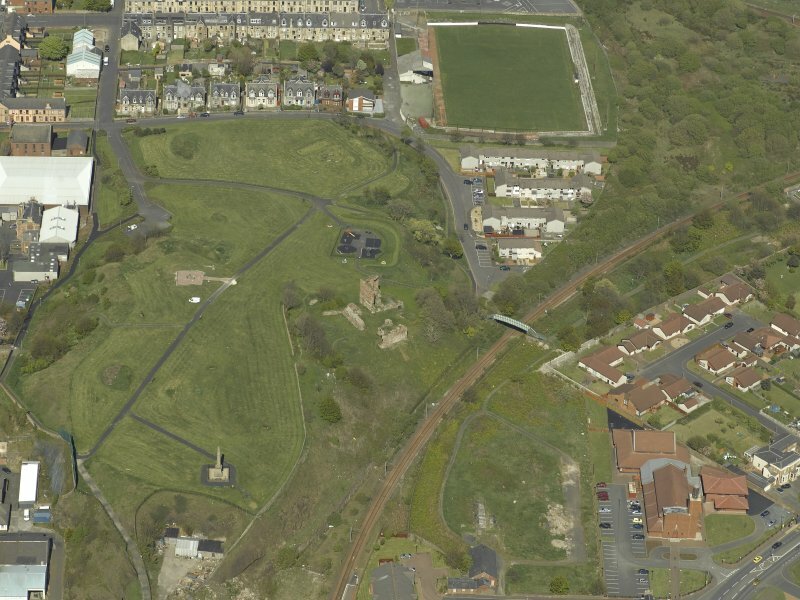 Oblique aerial view centred the Church with the remains of Ardrossan Castle adjacent, taken from the S.
Scanned image of general view. 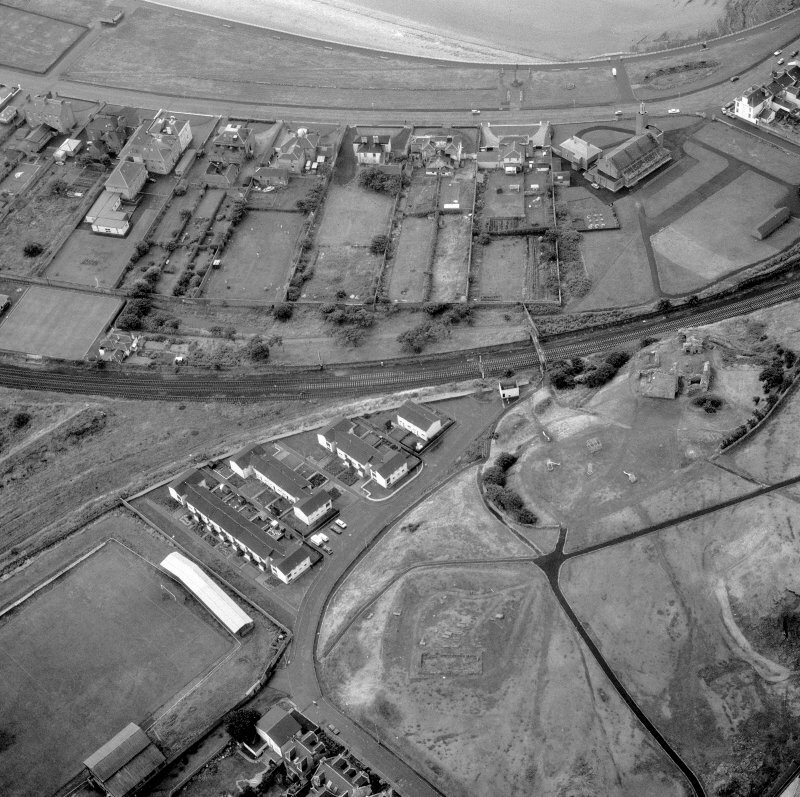 Oblique aerial view centred on the remains of Ardrossan Castle with the Monument and Church adjacent, taken from the SW.
Non-Guardianship Sites Plan Collection, DC23058, 1937. Ardrossan Castle is generally as described above. Of the southern block, the vault, which remains almost entire, measures 8m by 5m internally. The small rectangular block on the SE, at a lower level that the vault, comprises two compartments, the walls of which are 1.5m maximum height internally and 1.2m thick. The walls of the NW block are 2.5m in maximum height and vary from 1m to 2m in thickness. In the NW corner of this block is a stairway leading down to a well, which is under the wall. The keep at the NE angle is divided ito three compartments. Most of the N and W walls remain almost at their original height and vary in thickness from 1.7m to 2.5m The subdividing walls are only 2.5m maximum height. A wall, 2.5m thick and 1.5m high, runs off at an angle from the NW corner of the castle. On the W side there is a partly filled-in gully which may have been carried round the N side as a defensive ditch, but no traces of such exist. On the other sides, steep slopes descend to the railway below. The remains are in poor condition. Visited by OS (JLD), 7 September 1956. 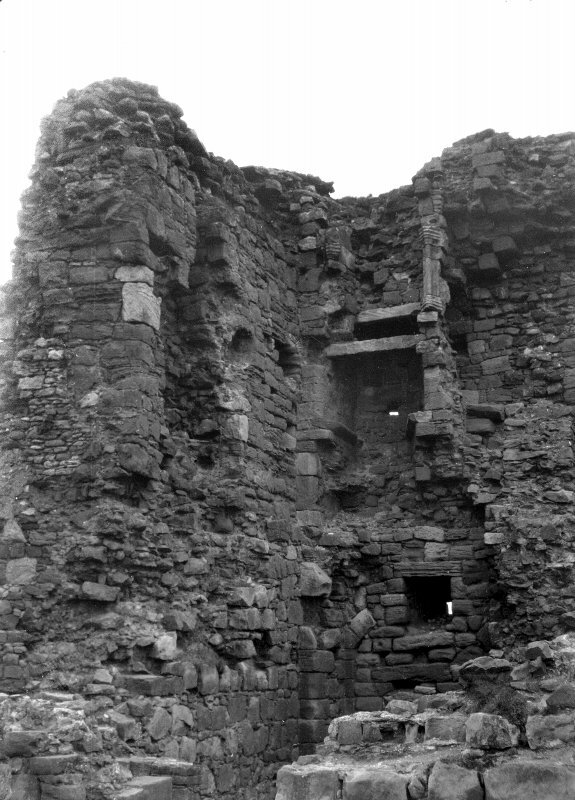 Ardrossan Castle occupies a point of rock, detached from the main promontory by a ditch to the W, about 100ft across and artificially deepened with a stone revetment now almost entirely buried beneath a modern rubbish dump. To the N was another ditch probably almost entirely man made, now only showing as a slight hollow in the ground while on all other sides the ground slopes very steeply. The above castle itself takes up the whole summit of the hillock, enclosing a small central courtyard. To the NE there is a large keep or gatehouse, the NW corner of which still stands to just below the battlement level and it also has two cellars below ground level; a range of buildings with a well off a deep passage lies up against the curtain wall to the W, which still survives to a height of over 10ft. A second tower lies at the SW corner; its vaulted ground storey survives as an open-ended arch. 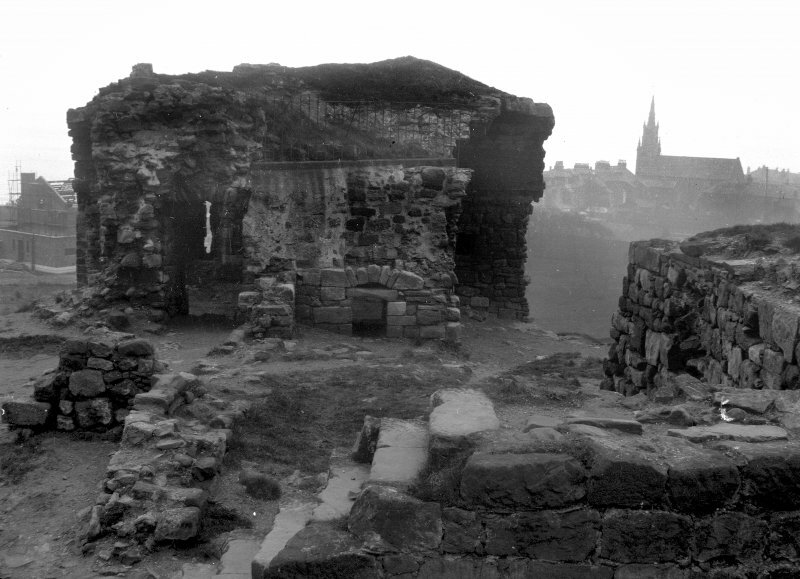 S of the keep, E of the courtyard, there was another building now only represented by its foundations. Four main building periods have been noted. 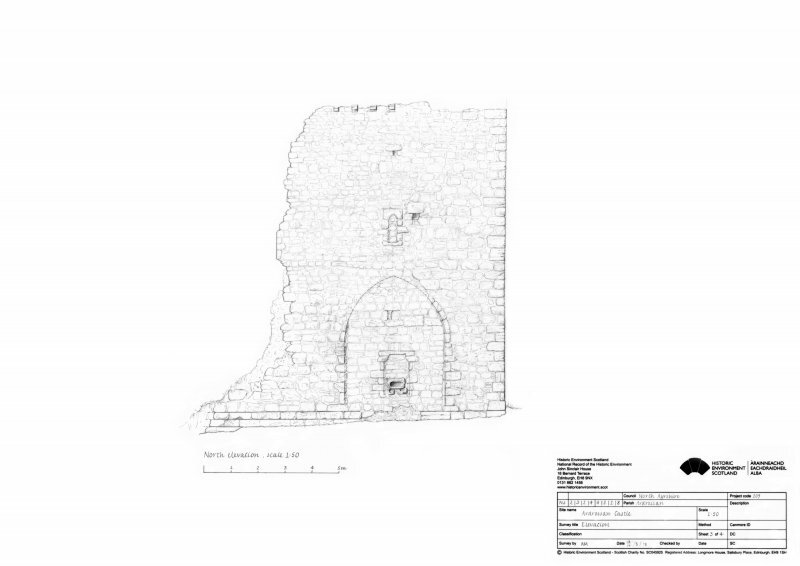 Phase I is now represented by the bottom part of the gatehouse, the bottom part of the N and W curtain wall, and most of the building S of the gatehouse. These were apparently the first stone buildings on this site (cf NS24SW 4.1). When intact, they formed a castle consisting of a forward projecting gatehouse block, backed by a courtyard, datable to the late 13th or early 14th century. Phase II represents a substantial rebuilding. 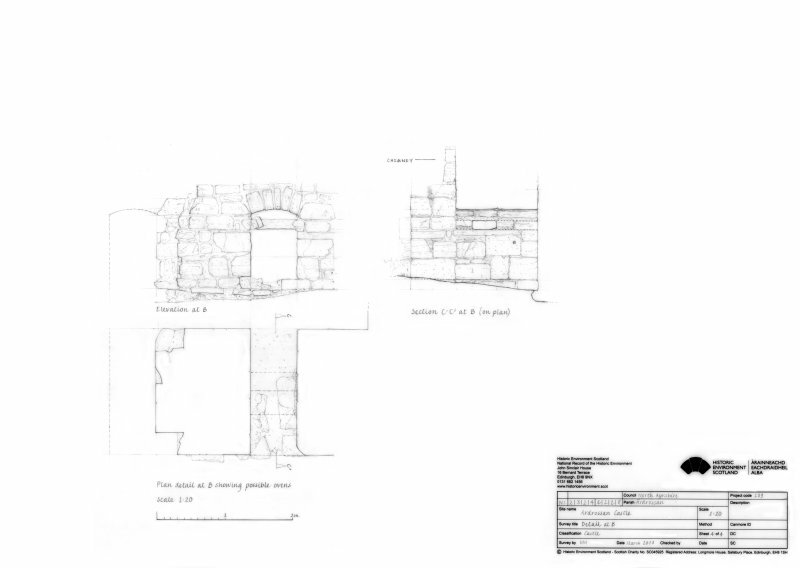 The gatehouse was rebuilt from first floor up, the building not being high as it stands today, work carried our elsewhere is difficult to demonstrate. This phase probably represents a refurbishing of the castle after a destruction during the Wars of Independence. Phase III saw extensive new building, probably over a long period of time. 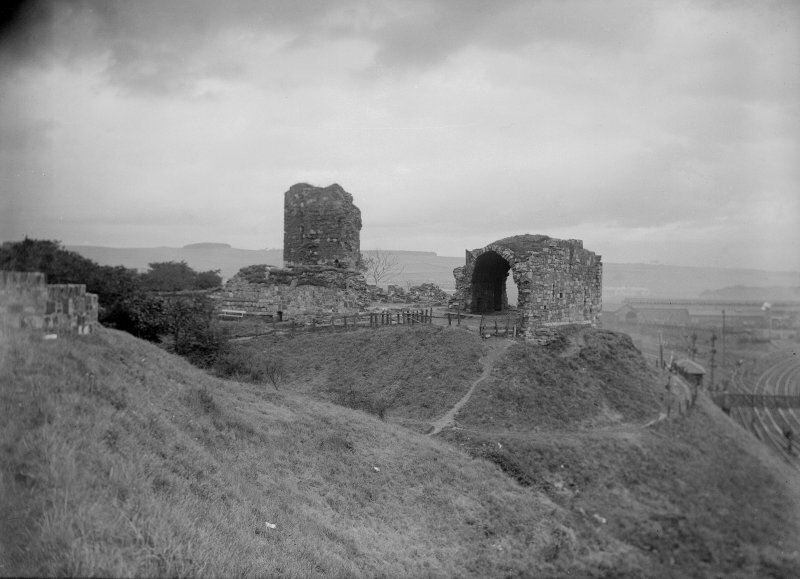 The gatehouse was remodelled, being transformed into a keep or towerhouse, the old entrance being reduced to a small doorway, and the keep was heightened. This keep was known as the "Read Tower". W of the keep and along the W curtain wall were a range of buildings, also of this period, apparently replacing earlier ones of wood. The building in the NW side of the courtyard may have been a chapel. At the SW corner are the remains of another tower, now surviving only as a large, open-ended arch overlooking the ditch to the W, with the old curtain wall traceable running across it and under its S wall. The wall enclosing the S of the courtyard, and much of the building S of the keep, were all built at this time, i.e. the 15th or early 16th, century. In phase IV the old entrance through the keep was finally blocked up, a wide-mouthed gun port being inserted, probably in the 16th century. 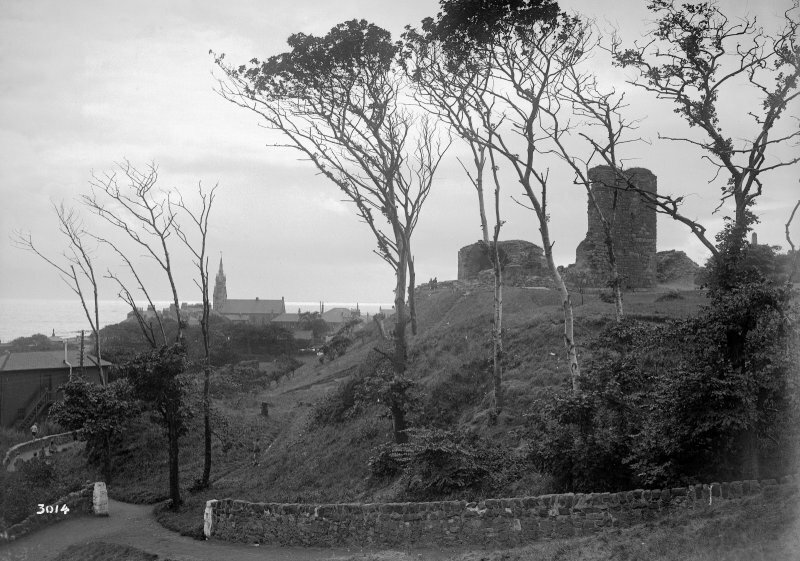 The castle is traditionally said to have been destroyed by Cromwell, certainly it was ruinous by 1689, and was allowed to decay until 1911 when the Town Council had most of the debris cleared away and the surviving walls restored and pointed. 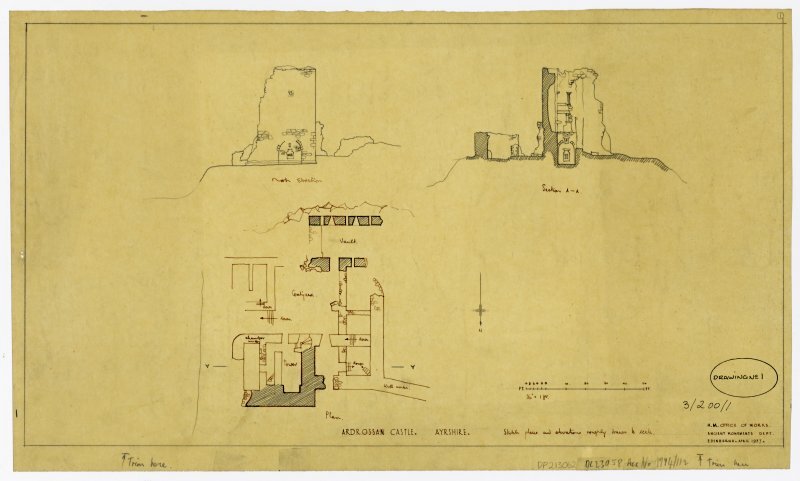 Photcopies of the site plan, and the plan and section of cellars at Ardrossan Castle, 1910 and 1912, are now with the NMRS. No change to the previous reports. Visited by OS (JRL) 13 October 1982. 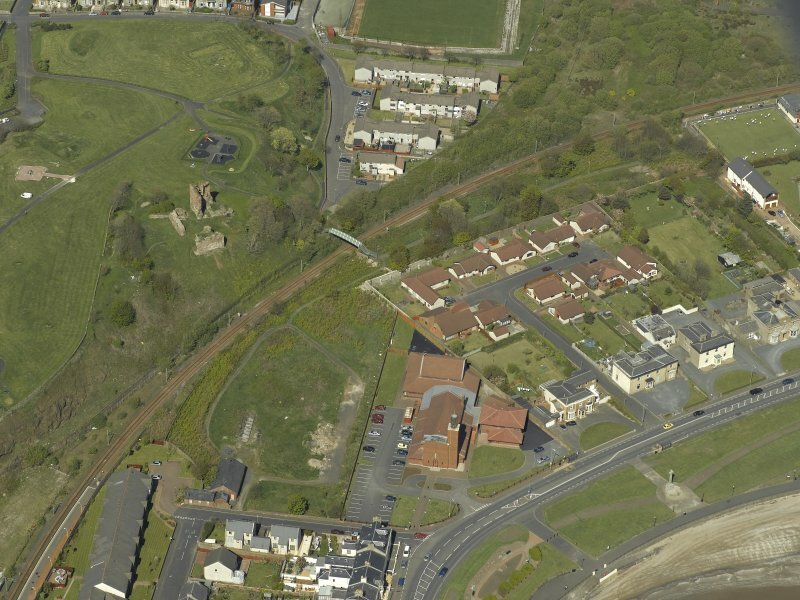 Archaeological works during the installation of a new fence around Ardrossan Castle, Castle Hill, Ardrossan. 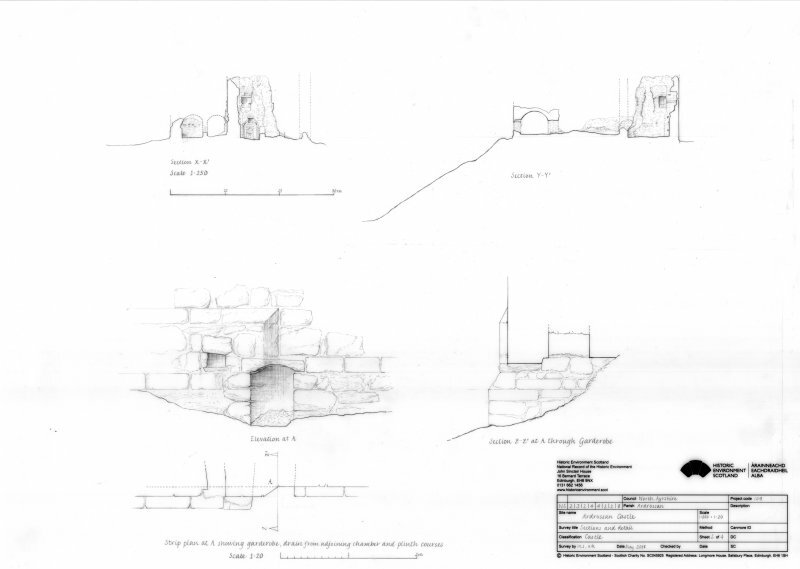 The archaeological works were designed to monitor the excavation of the post-holes for the fence to ensure that the installation could proceed while dealing appropriately with the identified adverse impact on the archaeological resource. No significant archaeological deposits were revealed. The only anthropic material that was recovered is associated with the nineteenth and twentieth century such as glass, plastic and other general waste material. No new deposits of significance were discovered during the course of these works. NS 23237 42290 A watching brief was undertaken 8–20 June 2012 during the excavation of postholes for a new fence around Ardrossan Castle. No finds or features of archaeological significance were recorded and all finds, such as glass, plastic and general waster, were of 19th- and 20th-century date. 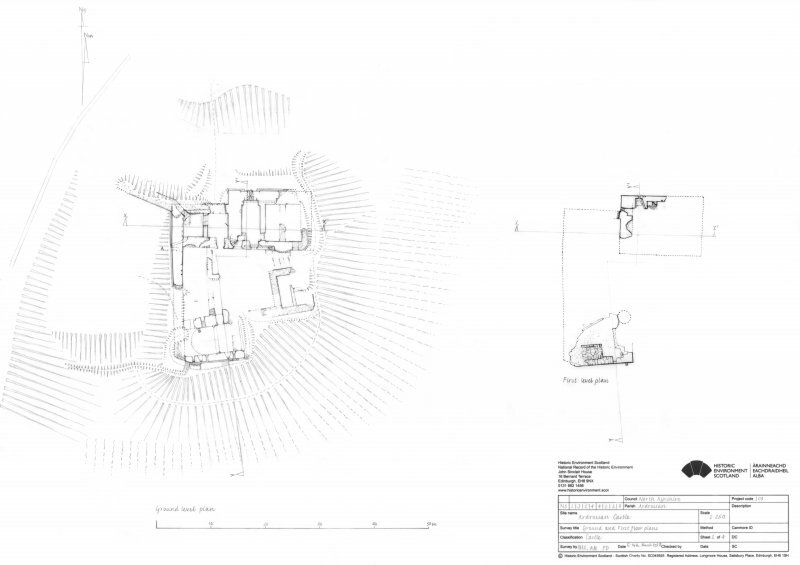 Archaeological monitoring undertaken during the stripping of soft sediments from 1st floor level of the kitchen vault at Ardrossan Castle, North Ayrshire revealed a later paved surface interpreted as a bonfire stance and a number of earlier features associated with the castle.